CNC machinists work with computer numeric controlled (CNC) machinery from setup through operation to produce parts and tools from metal, plastic or other materials. CNC equipment is precision machinery programmed by specialized software to produce precision parts by cutting, drilling and grinding. CNC machinists adjust the machines to control speed, material feed and path of cut. They also perform machine set-up, maintenance and use a wide variety of precision measuring instruments and inspection techniques to produce quality products. Pay scales can range from $12.50 to $25.00 per hour. Schedule begins April 17th, Monday – Friday at the Carver Center from 8:30 a.m. through 5:00 p.m. Self paced Part 1 can be done at the school, home, etc. On-going enrollment, student can begin at any time upon approval of instructor. This is the entry-level course of the Machining Skills Certification program. This course provides an exploration of the basics in machining, raw materials, use of hand tools, and safety and maintenance. First part will be self paced, web based that teaches the basics of Blueprint Reading, Geometric Dimensioning and Tolerance, Quality Control, Machining Processes, Machine Setup, CNC Machine Operation, Precision Measurement and Gauging, Cycle Time Optimization. Each module is tested. The Apprenticeship program has a total of 576 classroom hours plus 8000 hours on the job training. For more information, please contact Center for Workforce & Community Education at 540-937-2915. 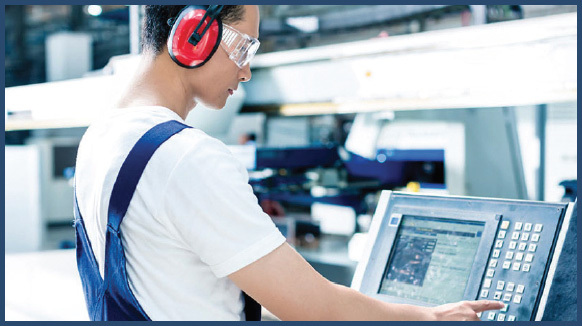 This program is designed to provide the student with the skills and to become an operator of CNC (computer numerical control) machines. Credentials will be earned from NIMS (National Institute for Metalworking Skills) as they progress through the program. ​​​Basic CNC Machine Operator.